Bill Windsor files Motion for Dismissal without Prejudice of Brenda Williamson. 1. The pro se PLAINTIFF has researched Missouri law to the best of his ability and has been unable to find a case to indicate if the PLAINTIFF’S proposed Amended Pleadings filed on July 2, 2013 is sufficient to remove Brenda Williamson as a party. Therefore, the PLAINTIFF files this alternative motion in hopes that one or the other will be sufficient to effect this change. 2. PLAINTIFF has been unable to locate DEFENDANT BRENDA WILLIAMSON. 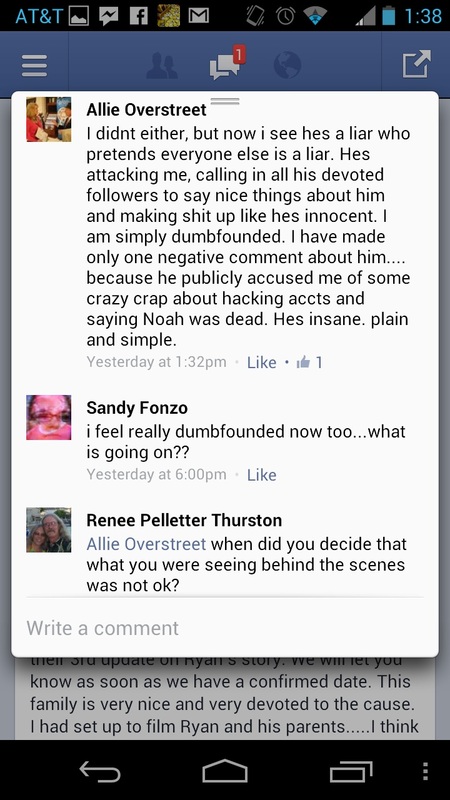 The address that she gave the PLAINTIFF is invalid. She has refused to provide her address upon request. Online searches have revealed numerous addresses, but none of them seem to be valid. A skip trace service is yet to determine what her current address is. The PLAINTIFF’s position in 13LF-CV00461 is being jeopardized because the Clerk of the Court will not issue subpoenas required for discovery by claiming that non-party subpoenas will not be issued until all parties have been served. Therefore, the PLAINTIFF feels that he has no option but to dismiss DEFENDANT BRENDA WILLIAMSON without prejudice so he may add her as a party in the future when she is located. The PLAINTIFF will continue to attempt to identify her address, and he will seek to have her added as a party at a later date. WHEREFORE, PLAINTIFF prays that this Court enter an order granting this MOTION FOR DISMISSAL WITHOUT PREJUDICE OF BRENDA WILLIAMSON AS AN ALTERNATIVE TO NOTICE OF AMENDED PLEADINGS; dismiss Brenda Williamson as a Defendant without prejudice so the PLAINTIFF may add her as a party once she is located; and grant such other relief as the Court deems appropriate. 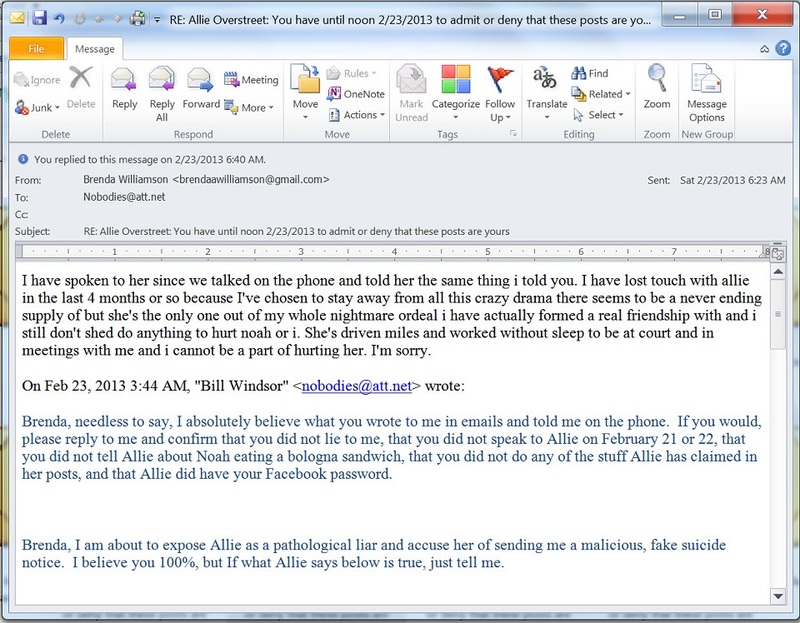 This entry was posted in Allie Overstreet, Bill Windsor, Brenda Williamson, Civil Litigation and tagged Allie Overstreet, Bill Windsor, Brenda Williamson, Civil Litigation on July 3, 2013 by admin. Bill Windsor files Notice of Amended Pleadings. 1. PLAINTIFF has been unable to locate DEFENDANT BRENDA WILLIAMSON. The address that she gave the PLAINTIFF is invalid. She has refused to provide her address upon request. Online searches have revealed numerous addresses, but none of them seem to be valid. A skip trace service is yet to determine what her current address is. Therefore, the PLAINTIFF feels that he has no option but to amend his pleadings to remove DEFENDANT BRENDA WILLIAMSON. DEFENDANT BRENDA WILLIAMSON has not filed a responsive pleading, so this Notice of Amended Pleadings does not require a motion or approval of the Court. PLAINTIFF has effected this removal by amending pages 1, 3, and 13. These amended pages are attached hereto as Exhibit A. All other pages remain the same. 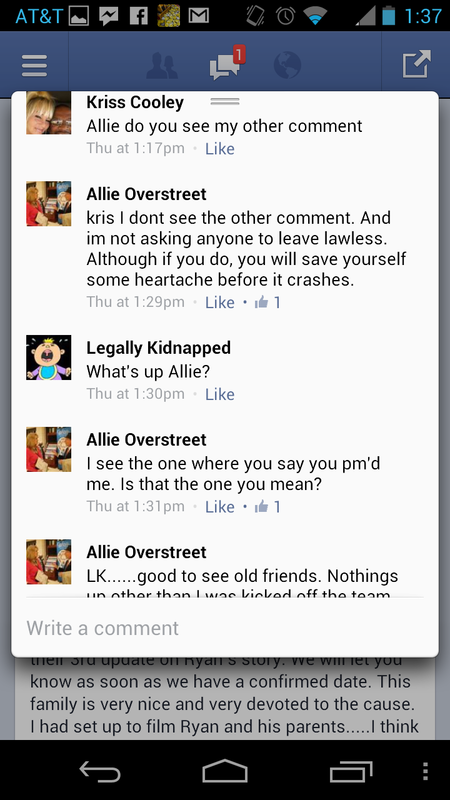 This entry was posted in Allie Overstreet, Bill Windsor, Brenda Williamson, Civil Litigation and tagged Allie Overstreet, Bill Windsor, Brenda Williamson, Civil Litigation on July 2, 2013 by admin. 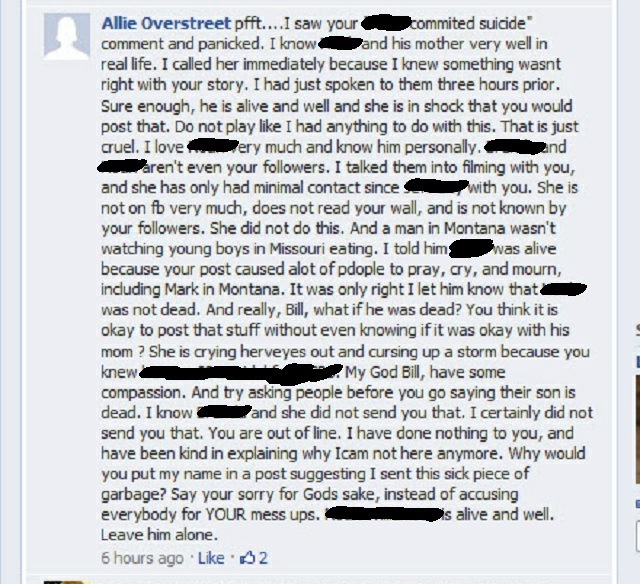 Allie Overstreet admits that she published information on Facebook (that is defamatory to Bill Windsor). 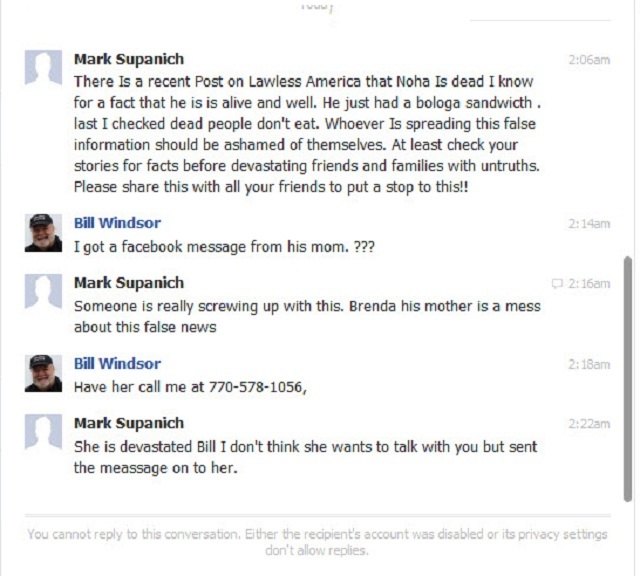 This entry was posted in Allie Overstreet, Bill Windsor, Brenda Williamson, Cyberstalking, Defamation, Facebook, Harassment, Libel, Lies, Mark Supanich, Slander and tagged Allie Overstreet, Bill Windsor, Brenda Williamson, Facebook, lies on February 23, 2013 by admin.